It rained a little bit today, and so it looks like the liquid surrounding the meat has now doubled. 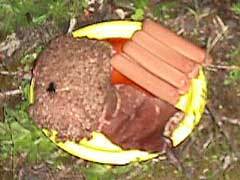 I noticed a definite stench as I approached the meat - things are turning out nicely. Ok, I admit it. I need help with determining whether or not those are maggots. 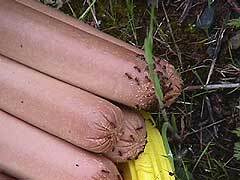 The ants apparently like the hot dogs. 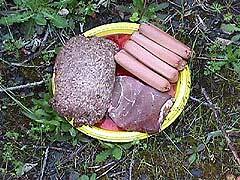 I haven't seen them on the other meat items. They've been working on cutting through the dogs plastic-like outer defenses. 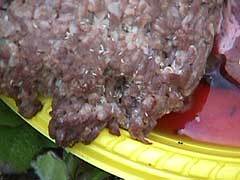 The flies like the ground beef. No one likes the steak. I wasn't aware that bugs had any taste preferences. Neat. As an added bonus, I went out last night and took a pict. I had no idea what I was aiming at, considering it was pitch black outside. I got back inside, and loaded up the image - I had captured the whole plate in the shot, but what the hell is that black thing? I am not going near the meat at night anymore.